Ayurveda is a holistic approach to health that is designed to help people live long, healthy, and well-balanced lives. It has been practiced in India for at least 5,000 years and has recently become popular in Western cultures. The basic principle of Ayurveda is to prevent and treat illness by maintaining balance in the body, mind, and consciousness through proper diet, and lifestyle, as well as herbal remedies. Ayurveda believes that disease results from an imbalance in the doshas (see below), and uses many herbs for treating illness. It also highlights the expression of positive emotions and the need to attune your life to the natural rhythms of the body. 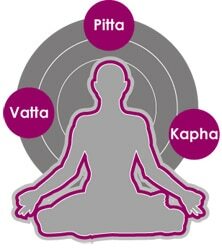 Everyone has vata, pitta, and kapha, but usually 1 or 2 are dominant in a particular person. Many things can disturb the energy balance, such as stress, an unhealthy diet, the weather, and strained family relationships. The disturbance shows up as disease. Ayurveda prescribes treatments to bring the doshas back into balance. Today’s TIP : Don’t attempt to change your lifestyle and habits overnight. Take it easy and trust your gut.